HOW IT WORKS: All #1 OPM songs of 2018 were included and ranked according to their longest stay at the No. 1 spot. In case of a tie, the basis will be the number of weeks the song stayed on the chart. If there is another tie on the length of stay on the chart, ​the song which debuted higher on the chart will be ranked first. The cut-off period for OPM Top 10 is from the first charting week of February 2018 until the week of December 22, 2018. Watch the music videos of our Top 10 OPM songs of 2018 below! 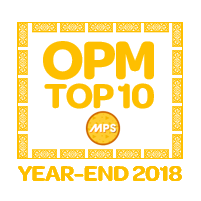 ​See what fans has to say about the OPM Top 10 MPS Year-End 2018 results! Yeng Constantino took over the top spot this year with her mellow hit "Ako Muna" spending 5 weeks on no. 1 while last year's 4-peat champion Sarah Geronimo had double entries alongside with Julie Anne San Jose. IV of Spades and Moira Dela Torre got their very first placement on our entire year-end countdown history. 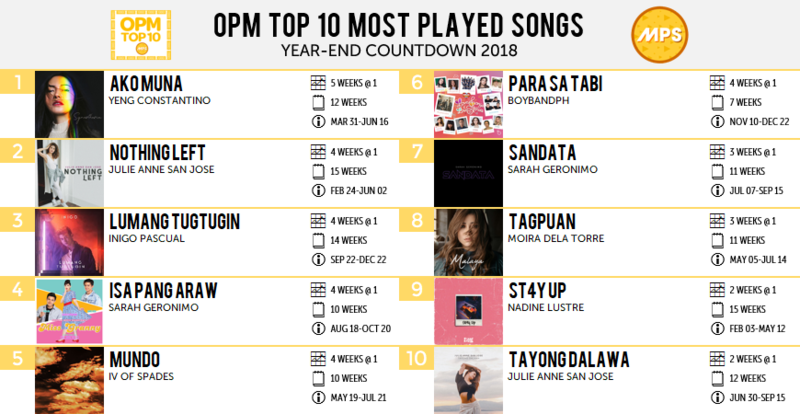 Congratulations to all the songs and artists who made it to the OPM Top 10 Year-End 2018! Thank you for giving us a year worth of amazing music! For more updates, stay conneted on our Facebook, Twitter, Instagram and Website!